I love shouting about books I've loved, and what better excuse is there to jump up and down waving a book you think everyone should read than the summer? Over the course of the summer holidays, I'm going to be sharing one fab read a week. They won't necessarily be your typical beach reads, simply books I've adored recently and want to share with anyone who will listen. You've probably heard a lot of people already singing the praises of Eleanor Oliphant - and with good reason. I have to admit I was a little dubious before I dipped into the book, because how could it possibly live up to all the hype? BUT IT DID. 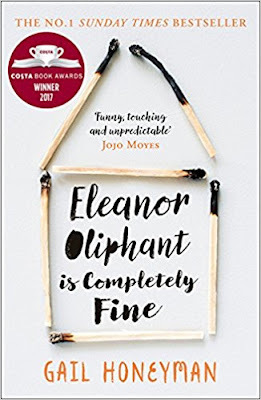 Eleanor is a wonderful, quirky character who had me giggling, cringing and reaching for the tissues. 'Oh, Eleanor' often ran through my head while I was reading the book, either because she'd made an amusing faux pas or because she was breaking my heart a little bit more. As Eleanor establishes new friendships and breaks from her usual routines, we start to see glimpses of the life she's endured, the experiences that have shaped her into the woman she has become. While on the surface Eleanor can appear odd and provide a source of amusement for her work colleagues, we discover why she's developed her quirks and outlook on life. Eleanor Oliphant is Completely Fine is funny and heartbreaking and easily my favourite read of the year so far. Have you read Eleanor Oliphant? What did you think?